The family estate consists of 11 hectares (27 acres) in the finest terroirs of Châteauneuf-du-Pape. The estate’s terroirs are located on a stony plateau and are sandy or chalky, depending on the plot. The soils of Châteauneuf-du-Pape are covered with large pebbles that are heated by the sun and release steady gentle warmth through the day. This interaction promote grape maturity and concentration. The Domaine has a mosaic of traditional grape varieties, which impart aromatic complexity, balance and power to the wines. For the reds: chiefly Grenache Noir, supplemented by Syrah and Mourvèdre. For the whites: Roussanne, Bourboulenc, Clairette, Grenache Blanc. Harvesting takes place in mid-September. The grapes are loaded in crates, and vinified at our winery in the village. When they settled in Avignon in the 14th century, the Popes realised the promise of the Châteauneuf-du-Pape terroir. 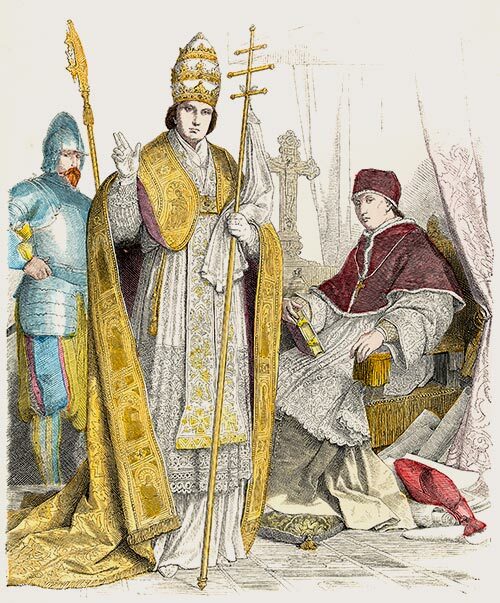 In 1314, the first Avignon pope, Clement V, discovered the village’s rich terroir. His successor John XXII built an imposing fortress on the village heights, and thanks to him the wines of Châteauneuf-du-Pape acquired impressive credentials. The vineyards spread and their reputation grew beyond the papal enclave. The wine was shipped in barrels to Italy, Germany and Britain. And decades later, it crossed the Atlantic and took its first steps in the USA. Under John XXII, the handsome village became the popes’ summer residence. “The Popes’ Wine” was born! It became the precious nectar that opened doors in the great courts of Europe.nes. 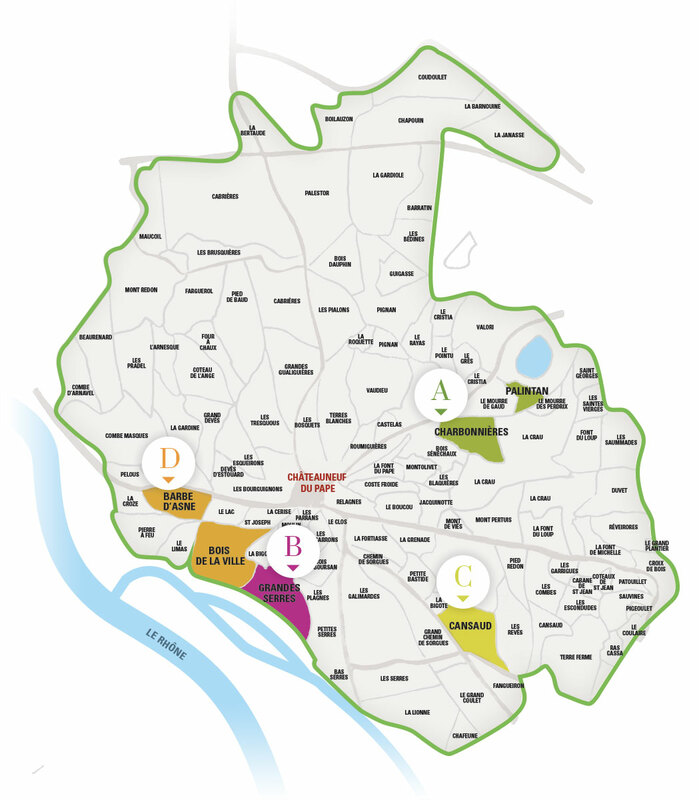 There are three main AOC Châteauneuf-du-Pape terroirs. Soils rich in sand, clay and safre (a kind of friable sandy rock). In this pebble-covered terroir, we have a superb plot of old Grenache and Mourvèdre, which we vinify together. Domaine Clef de Saint Thomas red. The young Syrah planted here will enter production in 2019. The vignerons of Châteauneuf-du-Pape were the architects of the AOC (Appellation d’Origine Contrôlée) system – which is the foundation of France’s wine industry and the cause of its success. In the first half of the 20th century, strict production rules were introduced. In 1923 the local growers, aided by vigneron and jurist Baron Le Roy de Boiseaumarié, formalised their wishes. The production rules were completely new: regulation of growing methods, minimum alcohol content (12.5% ABV), a restrictive list of authorised varieties, and mandatory crop sorting. Their example would be followed by other French wine-producing regions. Their work met with success: on 21 November 1933, France’s highest court confirmed the appellation’s boundaries and rules of production. These rules – a few tweaks aside – are still in force today, guaranteeing the quality of Châteauneuf-du-Pape wines. On 15 May 1936, the appellation decree was published, and Châteauneuf-du-Pape became France’s first AOC for wine. The appellation’s vineyards now cover 3,200 hectares in the municipalities of Châteauneuf-du-Pape, Bédarrides, Courthézon, Orange and Sorgues. * Bonus item: in 1954, the village council passed an anti-flying saucer by-law – and today’s mayor continues to defend it, all these years later! This bottle, with its coat of arms, is the showcase of Châteauneuf-du-Pape wines. Created in 1937, it helps in promoting and driving recognition of the wines. It is also a collective brand of the AOC Châteauneuf-du-Pape vignerons. Thirteen varieties are permitted in the appellation’s red wines (94% of output) but also in the whites (6% of output): Grenache (Noir, Gris, Blanc), Syrah, Mourvèdre, Cinsault, Clairette (Blanche and Rose), Vaccarèse, Bourboulenc, Roussanne, Counoise, Muscardin, Picpoul (Noir, Gris and Blanc), Picardan and Terret Noir. Châteauneuf-du-Pape is an AOC wine produced in the municipalities of Châteauneuf-du-Pape, Orange, Bédarrides, Sorgues and Courthézon. It was here that the Appellation d’Origine Contrôlée concept was first introduced. In 1923, Baron Pierre Le Roy de Boiseaumarié set up a union to advocate it. Of the 13 varieties allowed in Châteauneuf-du-Pape, eight are for red wines, five for whites. Vigorous and fertile, Grenache is king in Châteauneuf-du-Pape. It gives wines a full body, though fairly pale colour, and high aromatic potential with notes of violet, kirsch-soaked cherries, and cassis. .
Syrah provides tannins, colour and powerful aromatics: raspberry, cassis and black berry fruits, evolving towards leather and truffle. It imparts an attractively dense garnet/purple colour. Tricky to cultivate, and late to harvest. Mourvèdre supplies powerful aromas, with low acidity and a superior tannic structure. Combined with other varieties, it helps wines age gracefully thanks to its antioxidative power. A heat-resistant variety to adds elegance to our wines. Fairly pale, low-tannin wine. When carefully cultivated with low yields, it delivers the finesse one expects. Imparts attractive structure, with distinctive and fine subtle aromas of white blossoms. This noble variety yields subtle and complex wines of great elegance, and exudes floral scents. Characterised by fresh and floral aromas. Gives wines with low alchol content. This vigorous variety adapts well to the warm, stony soils at Domaine de la Clef de St Thomas. It yields rich wines with subtle, complex and floral aromatics.